For a couple of weeks my excuse for everything has been "because I'm nearly 9 months pregnant!" Now, I can say "because I am 9 months pregnant!" I can only use this whole pregnant thing for another 3 weeks so you better believe I am milking it. After that I am well aware that it will not be about me anymore, but instead the sweet little baby that I'll be holding (hogging). I got dressed today and put on some knee length boots over my skinny jeans. I have to choose my outfits wisely these days and think about whether Brandon will be around to help get my boots off. Asher tried to help me the other day and it wasn't happening. Bless his heart, he sure did try. I work up a sweat putting those suckers on, let alone getting them off. So why do I wear them you ask? I don't have a good answer except that my mom always taught me there's a price for beauty and beauty is pain. I'll be sure to pass that priceless little nugget on to Bella so one day when she is 9 months pregnant she'll be as determined as her mama to still dress somewhat trendy even if it means cutting off your circulation. I'm kidding. About the circulation. Not the beauty is pain part because that's true. It's a fact we women have to learn and then decide whether we want to follow. I suppose I could wear running shoes with every outfit like I see some pregnant women doing. You know those type who look smart and motherly and all "I don't care about fashion, it's all about my baby and I'll look unfashionable for them if I have to." They are obviously the ones following the advice of the pregnancy books that tell you to wear circulation socks, loose clothing, comfortable shoes and that your husbands big collared shirts or (and I quote) "jumpers" are an excellent choice for those 3rd trimester clothing options. Right. I'm going to put on one of Brandon's button ups with some leggings (another suggestion) and everyone is going to tell me how cute I look? Well, maybe they would but they'd be lying and should ask for forgiveness. If you happen to be one of those women who did in fact wear jumpers, I'm sure you looked cute. I'm not lying. But I would like to see a picture because I am curious what a jumper even is. If you read my post from last night, you should know my day was much better. Thank God because I might have really gone on a little "vacation to Mexico." I'd have this permanent glazed over look in my eyes as people walk by saying "Poor Laura, all she ever does is sit in that corner asking for a refill on her diet coke in spanish." I'm kidding of course. I'm tough. We mothers know to expect the not so good days and thankfully God grants us the grace we need for the next one. And when you have a day like I did yesterday, you forget all about it when you're putting your little girl to bed and she starts singing "You are my sunshine" to you. How can you dwell on a previously bad day when God speaks to you through your children like that. You can't. He means it when he tells us His mercies are new every morning. So today I am thankful for new, better, days and reminders of His love and mercy. 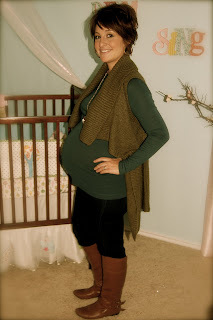 And I am thankful to be 36 weeks pregnant, wearing my favorite boots. It may take a husband and two small children to get them off, but I'm still wearing them! I love reading your blogs Laura!